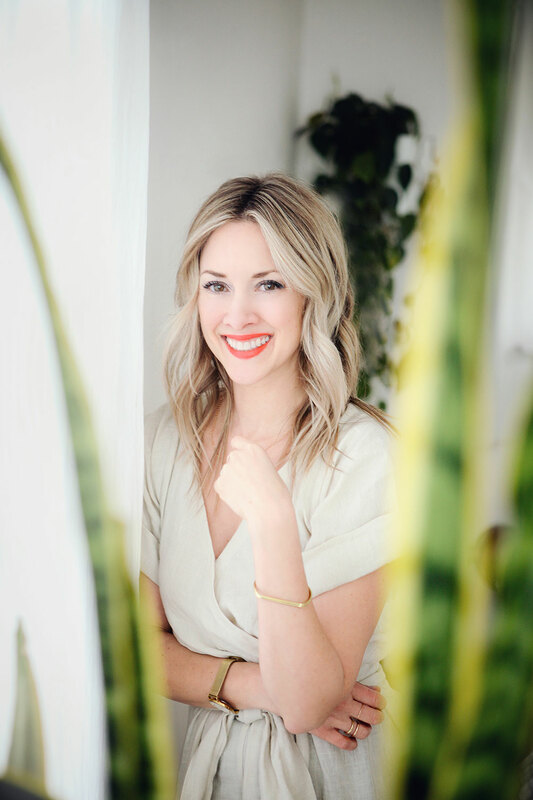 A couple of weeks ago I was blog surfing while jotting down a quick grocery list when this recipe, by the fabulous cookbook author, Alison Lewis, popped into my reader. A beautiful, simple salmon salad. Nice! So, I skipped out to the store and picked up some canned Alaskan pink salmon, just like she suggested. Yep, canned salmon. Sick to the max, right? I’m with you. I was like, “whaaaa” too, but after reading about the benefits of the fully-cooked health goldmine, I decided to dig out my can opener, put on a pretty red dress and tango with it. Since it was dinnertime, I went a slightly different route with the fish, pairing it with black quinoa, freshly minced cayenne, and velvety spinach. y.o.u. g.u.y.s. o.m.g. I’ll never look at canned salmon the same way again. There might even be puckered lips and a wink involved. Just sayin’. Cook the quinoa in boiling water until they burst and become little spirals, about 15 minutes. Drain if needed and return to pot. Heat the oil in a medium skillet over medium-high. Add the onion and cayenne chili, and saute until softened and starting to brown, 6 minutes. 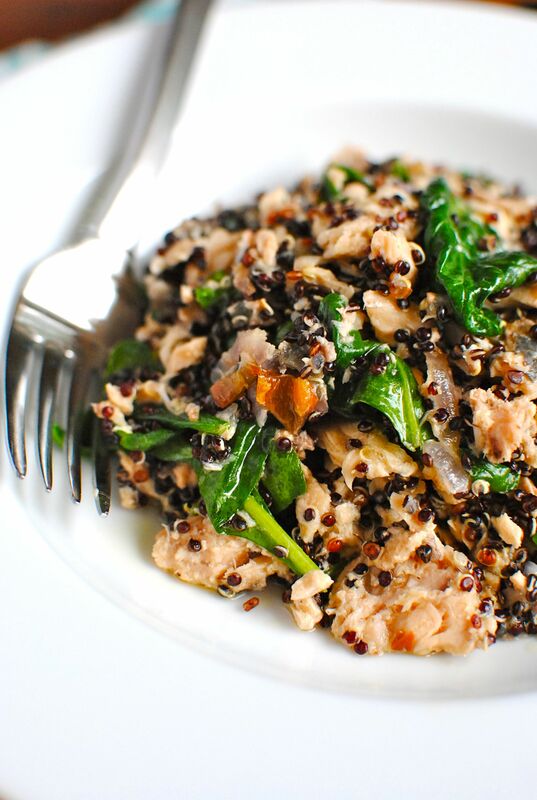 Add onion mixture to the pot with the quinoa, along with the salmon and spinach. Toss to combine. Give a good pinch of salt and pepper to the mix. Spritz with lemon and get all healthy! Yum! Black quinoa is so pretty. Brilliant! I love these meals for when I am cooking for just me. Black quinoa sounds delicious! What a great idea! This looks wonderful. I appreciate you mentioning me, and I am so excited too meet you in Nashville this fall! Thank you again girl! wow! i'm a first time commenter, but this is a beautiful blog! This dish looks soo good! I have only used canned salmon once, and didn't love it, but this is making me want to try it again!! I am going to make this. I have regular white quinoa in the cupboard but can grab some black....didn't know it existed, actually. Thanks!! What a beautiful post; I love this gluten-free dish and surely am going to try making it! Thank you for sharing. I made this tonight and it was my boyfriend's first quinoa experience - it was a good one! Added some balsamic vinegar for a little extra zest. Oh that's awesome! So glad he liked it. And balsamic, good grief - YES. How did I ever miss this fabulous salmon?! In love with this healthy & amazing recipe. This looks delicious! Simple and tasty and perfect for the leftover smoked salmon in the fridge. Thanks for sharing! Why is this cataloged under vegetarian? It has salmon in it. Oops! That one flew right past me. Thanks for pointing it out! It's updated. I have a lot of quinoa, but not the black. Can I use the white or is the black a different taste? It looks delicious! You may absolutely use whatever quinoa you have! There's no real difference in taste. At least to me! SUPER YUMMY! 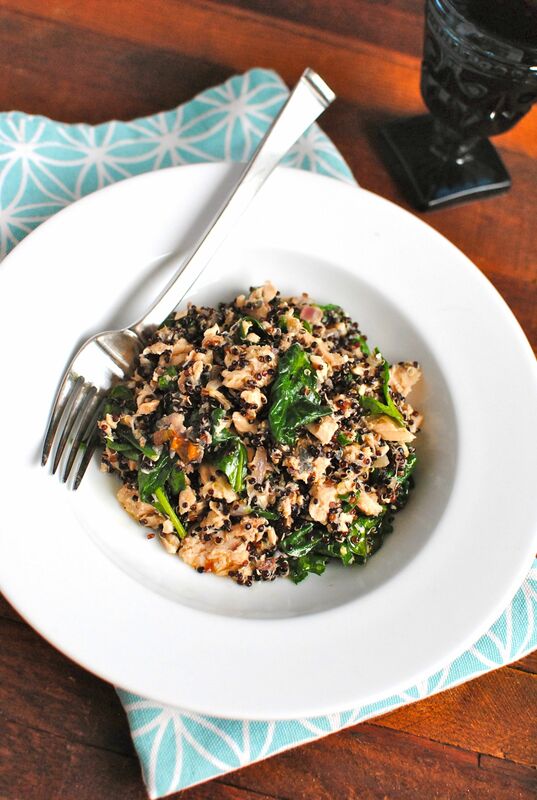 Made with frozen salmon, red quinoa and kale because that's what I had on hand, it was still awesome! What size of can of salmon? 6 oz can would be fine!